From Valerie Laken, the Pushcart Prize–winning author of Dream House, comes a powerful collection of short stories charting the divisions and collisions between cultures and nations, families and outsiders, and partners and misfits searching for love. Set in Russia and the United States, these are boldly innovative stories—tales of fractured, misplaced characters moving beyond the borders of their isolation and reaching for the connections that will make them whole. My foray into short story compilations has been pretty limited, but I can still tell you that Separate Kingdoms stories pack a massive amount of emotion into such short pieces. These eight stories literally bleed tragedy and angst, but in the best way possible. Laken's writing is absolutely stunning. Well-worded prose, mixed with bittersweet stories and descriptive language create one deep read. This is not a set of stories that will raise your mood, let me warn you now. However Separate Kingdoms is so beautifully tragic and so realistic that it makes you want to keep reading, despite the somber tone of the stories. What you'll find between these covers are portraits of individuals learning, or struggling, to cope. Each one of these stories contains someone who is battling inner demons, fleeing from reality, longing for something more, or simply avoiding everything in an effort to blend in. It is no surprise that sometimes I was uncomfortable while reading these stories. Watching these characters navigate their respective inner battles is heart wrenching and sometimes hits a bit too close to home. Laken's ability to write the bare, naked souls of her characters is admirable, to say the very least. I truly don't think I will be rereading this compilation. 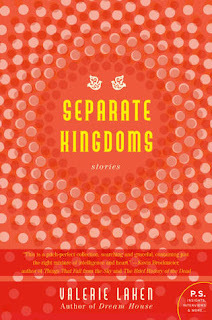 Although I was drawn in at the time, Separate Kingdoms is most assuredly not a light read. I applaud Valerie Laken for her ability to shine a spotlight on the dark and gritty parts of all of us. These stories may not make you feel good, but they will definitely make you feel something. The only word I can truly think of to explain what you'll find between the covers of this book is "poignant", but even that doesn't seem like enough of a description. 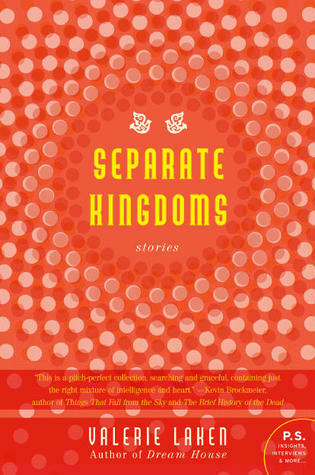 If you are a lover of short stories, or even a reader of great fiction for that matter, Separate Kingdoms is definitely something that you will want to check out.